Available in five sizes: mini, small, medium, large and giant (1-1/4" to 1-1/2"). Please specify desired size when ordering. 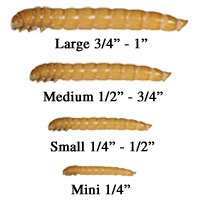 Additional charges for large and giant mealworm sizes (shipped overnight only). Why buy mealworms from Fiddle Creek Farms?